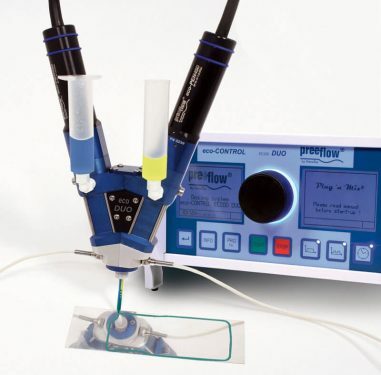 The ViscoTec flowplus16 compact inline fluid sensor delivers optimum process assurance for fluid dispensing or dosing applications. The IDMVG DV5005DFS Positive Displacement Auger Valve has been developed to accurately dispense high viscosity materials and has a disposable fluid path. The cartridges are easily interchanged for simple clean-up, allowing for continuous operation, and contain acetal auger screws which are hard wearing and have low surface energy for clean dispensing. Three versions of the disposable auger cartridge are available: 6, 8 and 16 pitch.